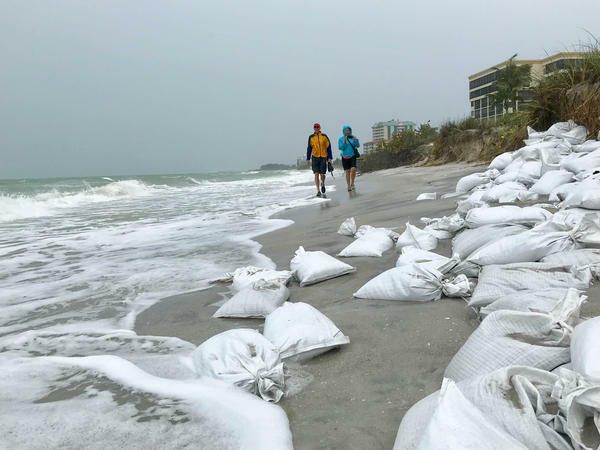 Tom Barwin (left) and Florida Department of Environmental Protection representative Kelly Cramer inspect Lido Beach following Subtropical Storm Alberto in late May. Even though Subtropical Storm Alberto only brushed the coast of Florida last month, at least one of its beaches experienced some significant damage. Lido Beach, a popular tourist spot in Sarasota, was under a state of emergency due to beach erosion. "Tropical force winds were not really consistent," Tom Barwin, the City Manager of Sarasota said. "The rain was not heavy, but the Gulf of Mexico was really churned up and it took a good seven to eight feet of beach." WUSF's Sam Newlon reports on efforts by the city of Sarasota to renourish Lido Beach following Subtropical Storm Alberto. During the storm, the surf was consistently pounding the sand on Lido Beach. Barwin said such beach erosion can lead to a variety of problems. The immediate issue is increased potential for flooding in public and private property, but the other is more cause for environmental concern. "This beach erosion is taking a serious toll on sea-turtle nesting and some of our summertime bird breeding," Barwin said. The city is seeking funding from the state to help fix the problem. The Florida Department of Environmental Protection has pledged $3.3 million to renourish Lido Beach. Sarasota was permitted to dredge up to 1.3 million cubic yards of sand to restore the beach, which is about 86,000 full dump trucks. Barwin said the city doesn't plan to use all that allotment, but it aims to renourish Lido Beach at least 100 feet into the Gulf of Mexico.